We are fortunate enough to be based in Pentwater with it's great fishing and long fishing heritage. From ice out to ice up, good to outstanding fishing is usually somewhere to be found outside or even inside Pentwater's harbor. In April, right after ice out, the Brown Trout fishing is first on the agenda and it can be excellent. Large Brown Trout are not unusual as soon as we can get the boat in the water. Rainbows are frequently in the mix and a surprise King Salmon is often a welcome challenge on light tackle. In mid-to-late May, some Coho usually make their way up to Pentwater, the Rainbow Trout fishing can be outstanding and the Kings start to show up in large numbers. Lake Trout often take our baits placed up high for salmon, so a mixed bag is the rule this time of year. This is the time where a chance at a "Grand Slam" of all five Lake Michigan salmonoids is the highest and the fish are the tastiest! There's nothing like spring salmon and Rainbow Trout on the grill! 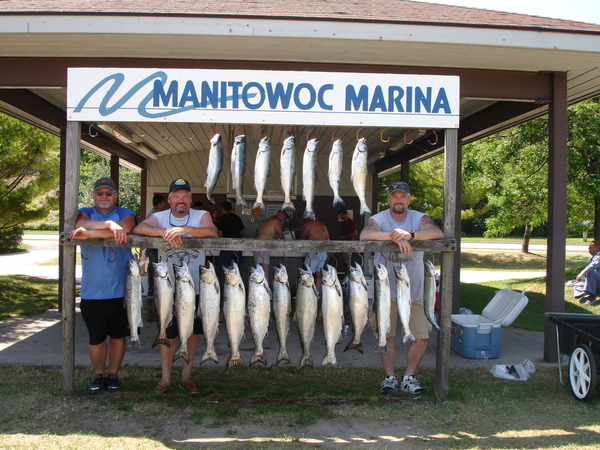 The hot mixed bag fishing continues into mid June until the lake warms up above the 60 degree range. 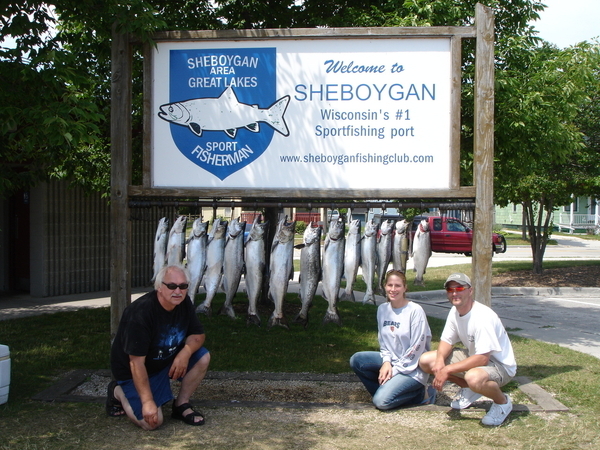 Late June, through July and into August the fishery sets up into the normal summer patterns. This is when Pentwater becomes a fish factory churning out King Salmon by the cooler full! The catch is dominated by King's this time of year with Rainbows mixed in. The numbers are usually lower than the spring but the cooler gets heavier with maturing fish. As the end of August rolls around, the mature fish start to hone in on Michigan's river's with spawning on their minds. The fishing is often hot and heavy right around the piers and we often never even go up on plane. If they are not around the pierheads you can bet they are someplace close. This fishery is the rule late August and into September. In late September and into October we are usually chasing younger salmon and brown trout until we put the boat away for the winter. 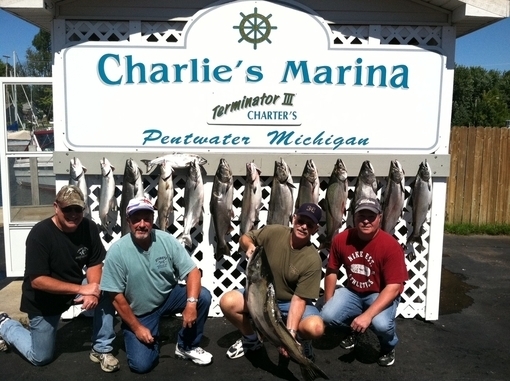 Pentwater's fishery is often changing through the season and with the weather, but years of fishing salmon tournaments at ports all over Lake Michigan have given us the experience and the flexibility to hunt up the fish and find a way to make them bite. We sometimes travel to other ports to fish tournaments, which are usually scheduled around peak fishing times for the port involved. You can charter with us to fish those ports too! Check out the tournament schedule if you would like to sample the action as we prepare for a tournament. We hope you get the chance to get in on the action with us sometime this summer. We look forward to having you aboard the TERMINATOR III! !